Housepets! - View topic - One Offs Set #31: SCIENCE! One Offs Set #31: SCIENCE! I envy Tiger's metabolism. He could be the key to solving obesity without diet, exercise, or surgery. Re: One Offs Set #31: SCIENCE! I always assumed Garfield's periodic diets are what kept him at a constant weight. Tiger burns off the excess calories through his hatred for Bino. Tiger burns off calories exercising with Chuck Norris. Let's see so far we have King and Tiger making that face which at the same time is both disturbing and cute. I wonder how many other dogs will be making that expression in the future? A smiling Bino would be too much though, the anger in his characterization wouldn't lend well to the effect. All we need now is another pet in the Arbelt household to play Odie. We can't have a Garfield based character without Odie. I see Zach as Nermal. Kind of. All Odie does is being so dumb that Daisy could outwit him with a single 'Hi! I'm Daisy!" Mod Edit: Please do not double-post. If you need to add new information to a thread and yours is the most recent response, you may use the edit button in your post's upper-right corner. It's also a missed fact that Bino's favorite food is also pizza as stated in his debut. Not to mention he was also supposed to be based on an earlier version of Garfield. Speaking of that, what exactly is Marvin's allusion to the Garfield comic? 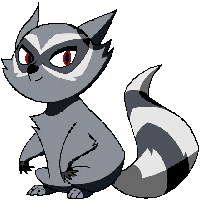 Oh, and Pap is the Housepets' Nermal. Bino isn't incapable of feeling emotions other than anger. He's not even evil - kind of rude, at times, and certainly with control issues, but those things do not preclude one from knowing and expressing happiness (or other non-hostile emotions). I'd wanna see Pap again, but I can understand he's hard to write original jokes for. I thought Pap got hit by a truck? Do you realize just how many people you drove into hysteria in front of their computers by this single post? Oh, you do. You're totally not Mr. Griffin after all. Not quite visible, but still. What the.... wow. Tiger would waste away to nothing if he were to go on a diet. He is a machine!! Second panel has my favorite Marvin face ever. Marvin is supposed to be Odie, but as an antithesis. gotta love the "Peanut wakes Grape" strips. Something about the art seems different about this strip. Can't seem to put my finger on it though..
Grape is very jumpy. Why did she sleep on the couch if she knew he was around? I like how Rick managed to hide the arms almost completely in this newest strip. A pattern developing in the future, maybe? Speaking of the previous one, which I feel the need to comment on: it was genuine gold. Like, refined, classic Housepets/Garfield/Calvin & Hobbes and all that. I loved it! because it's a way to admit she likes to be woken up by Peanut. Peaunut should have yelled new Pridelands series are coming up. 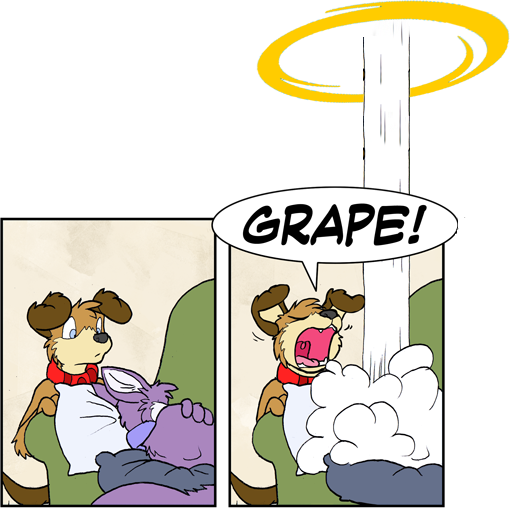 Somebody should do a pic with Grape on the ceiling fan. I agree with that, the Alt. text was my favorite part of this strip. Grape using two pillows... her laziness has no limits. But at least Peanut tried to be gentle. Now we know he will never do that again. That's the kind of thing that makes me wish there were a Housepets! cartoon. 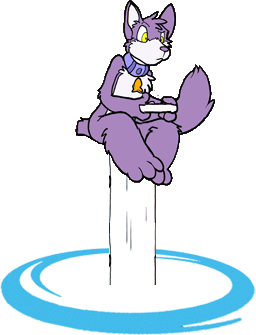 Seen it, but now I question how many Wii joysticks are in those darn portals. Ah Max, that adorable idiot.